Based on the NVIDIA Turing architecture and designed to handle the graphical demands of 4K gaming, the ZOTAC GAMING GeForce RTX 2080 Ti ArcticStorm Graphics Card brings the power of real-time ray tracing and 4K visuals to your PC games. It also features enhanced technologies to improve the performance of VR applications. The front panel of the card features a variety of outputs. There are three DisplayPort outputs, one HDMI 2.0 output, and one USB Type-C port. Moreover, a maximum resolution of 4096 x 2160 at 60 Hz is supported. The RTX 2080 Ti ArcticStorm is not just about high-resolution gaming. The engine can be boosted up to 1575 MHz while computationally intense programs can utilize the GPU's 4352 cores to accelerate tasks using CUDA or other APIs. In terms of memory, this GPU is equipped with 11GB of GDDR6 VRAM at a speed of 14 Gb/s and a 352-bit interface. For cooling, ZOTAC can work with a variety of liquid cooling hardware. 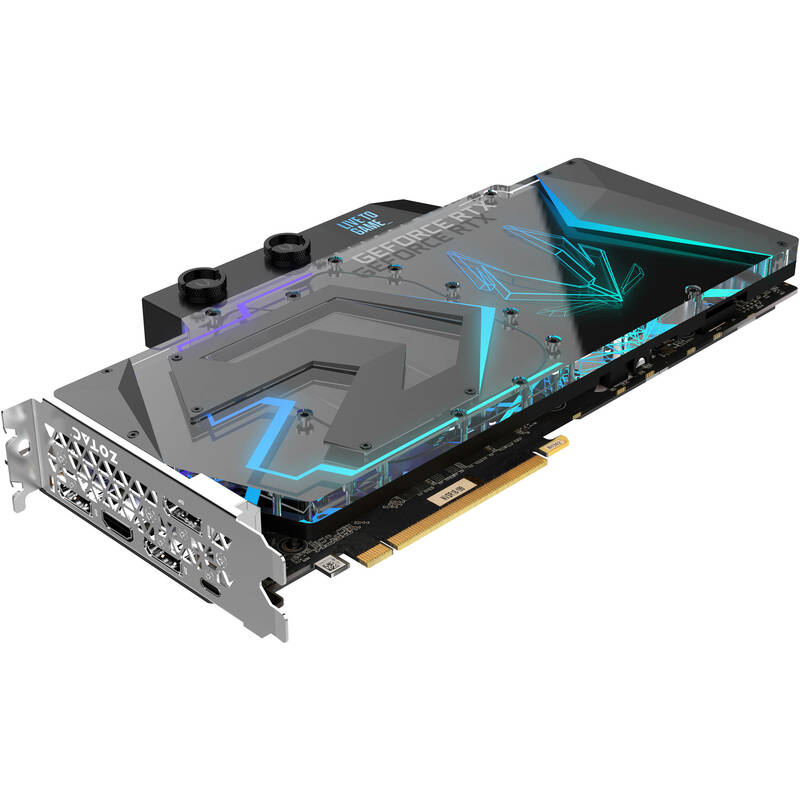 This graphics card also features SPECTRA 2.0, an advanced lighting system, which allows you to customize how your card looks. Utilize the redesigned FireStorm application to easily customize and set up your own color and lighting to suit your style. The NVIDIA GeForce RTX platform enables real-time ray tracing of objects and environments with physically accurate shadows, reflections, refractions, and global illumination. This architecture combined with a GeForce RTX platform, which fuses together with real-time ray tracing, artificial intelligence, and programmable shading. GeForce RTX Gaming GPUs come loaded with next-generation GDDR6 memory, support for DirectX 12 features, and more. Combining a subtle, minimal design with a strong industrial feel and a re-imagining of the use of LED lighting. With a dash of lighting utilizing precision guided laser etching to direct lighting, the ArcticStorm design shines. Moreover, its equipped with addressable LEDs, lighting, and color are now both fluid and dynamic. Enable lighting effects introduced solely for Spectra 2.0 hardware. Make the ZOTAC Gaming graphics card yours and personalize it to the theme of your gaming computer with just a few clicks. Easily change the color, brightness, or lighting mode to your liking in the SPECTRA section of the FireStorm utility. The ArcticStorm is fitted with a direct copper cold plate contact engraved with precise 0.3mm micro-channels, which supports supercharged heat transfer and maximum flow path. This GPU is designed to bring full coverage for the entire length of the board, with the liquid channel contacting critical components. Using the standardized and most used fitting, ArcticStorm has a wide selection of liquid cooling hardware compatibility. It's also built with G 1/4 threaded fitting and bundled barbs supporting 10mm inner diameter tubing. The GPU is compatible with various liquid cooling components, including reservoirs, pumps, radiators, fans, fittings, and tubing. A control chip provides live electrical current regulation and instant electrical deviation responses. POWERBOOST reduces ripple noise, minimizes power fluctuations, and has a high temperature tolerance that results in a long-lasting graphics card. Designed with an intuitive and minimal interface, you can get in and out quickly. Fine tune your ZOTAC GPU with enhanced intelligence and adjustable SPECTRA lighting. Or simply monitor the hardware status with the FIRESTORM utility.